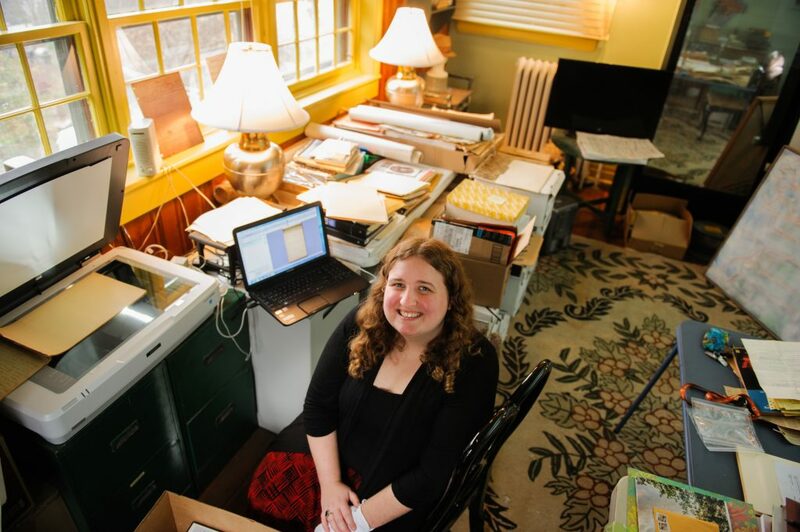 Jasmine Heath ’18 MEd is scanning documents at Anne Spencer House, an historic home in Lynchburg’s Pierce Street Renaissance Historic District. Her “office” is a second-floor sunroom that overlooks the garden. Her “coworker,” currently hiding under a cabinet, is a black-and-white cat called G.H., short for Gregory Hayes. Heath is surrounded by a sea of papers and ephemera belonging to the Spencer family, who lived in the red-shingled house for much of the 1900s and created legacies in literature, civil rights, and aviation. On a recent Thursday afternoon, Heath, a graduate assistant in University of Lynchburg’s School of Humanities and Social Sciences, is scanning an epic poem about the abolitionist John Brown. Brown is famous for his failed attempt to start a slave revolt in 1859 by capturing the arsenal at what was then Harper’s Ferry, Virginia. The unfinished poem, scribed on a faded, yellow legal pad, was written by Anne Spencer, who lived in the house with her husband, Edward, and their children, daughters Bethel and Alroy, and son Chauncey. Jasmine Heath, working at Anne Spencer House. Anne was a Harlem Renaissance poet, librarian, gardener, and co-founder of Lynchburg’s NAACP chapter, among other things. She also was the first African-American woman to have her work included in the Norton Anthology of Modern Poetry. Edward, a Renaissance man in his own right, designed and built the modified Queen Anne-style home, incorporating discarded architectural elements he picked up along his route as Lynchburg’s first African-American parcel postman. Their son, Chauncey, was a pioneering aviator, advocating for black pilots before and during World War II and helping start what would become the famed Tuskegee Airmen. In the first half of the 20th Century, the Spencers entertained a “Who’s Who” of African-American luminaries, including Langston Hughes, Zora Neale Hurston, W.E.B. DuBois, James Weldon Johnson, Dr. Martin Luther King Jr., and others. The Spencer home also was a safe stopover for travelers in the Jim Crow-era South. 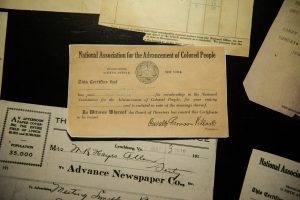 Some of the artifacts Heath is digitizing include papers from the NAACP. The Spencers helped found the local chapter. This isn’t Lynchburg’s first involvement with Anne Spencer House. In the College archives, there’s a photo of members of the College community visiting the home in the mid-1940s. More recently, faculty members, including Dr. Nina Salmon, have incorporated Anne Spencer, her house, and gardens into lesson plans, research projects, and field work. For several years in the early 2000s, Dr. Salmon’s English 112 (Composition II) class included Anne Spencer-related research and field study projects. Education majors presented programs about the poet at local schools and retirement communities. A music major performed a musical score written to one of her poems. Art students sketched the gardens. A student who also was an Emergency Medical Technician put together a first aid kit for use in the garden. Dr. Walton agreed, citing the “possibilities for high-impact practices and experiential learning for our students.” He added that there are “obvious points of interest for our English majors and creative writing minors, inasmuch as her poetry is everywhere in the house, sometimes written on the back of checkbooks and on box tops. Members of the L.C. 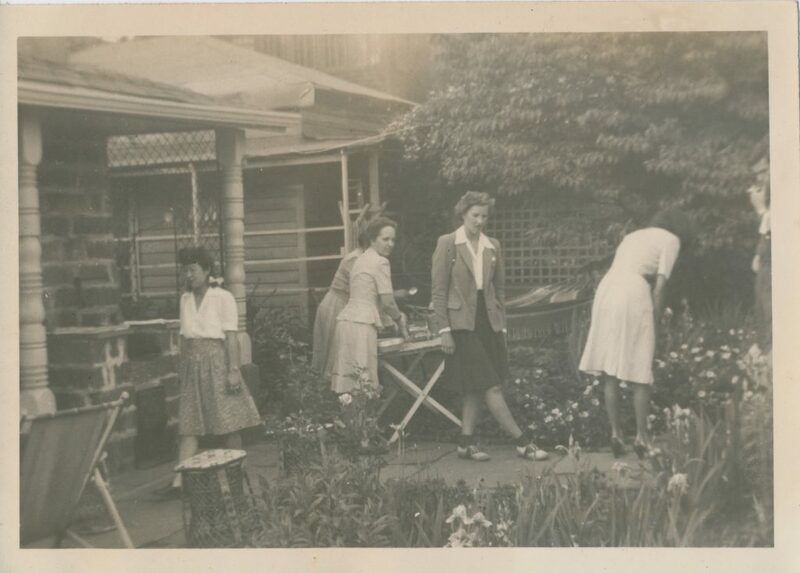 community visit the Spencer house in the mid-1940s. The photo is from an album donated by Dr. Gay Morrow ’43, in the College’s archives. Identifiable people include (far left) Yuri Nemoto ’46 and (second from left, facing camera) Dorothy Hunter, wife of then-Dean of Students and Religion Professor Barton Hunter.